What Is The Best Country To Buy Stocks? A topic we often review here is how expensive or inexpensive different stock markets are around the world. History has shown buying into markets that are expensive has led to below average returns over the next five to ten years, and buying markets that are less expensive has provided investment returns that yield more positive results. I posted the following list a few weeks ago which shows where every market in the world ranks from the least to most expensive based on the average of a few valuation benchmarks. Brazil and Russia are the least expensive markets in the world while the U.S. and Denmark are the most expensive. 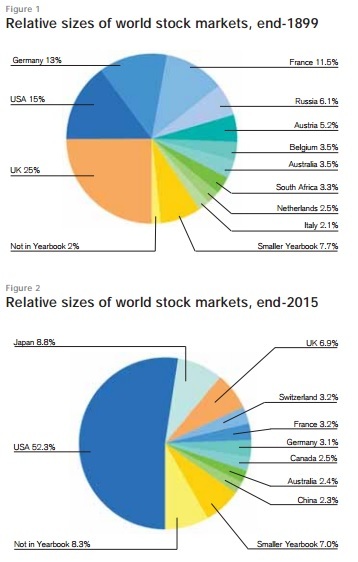 Based on this chart alone an investor would re-weight their portfolio heavily into Russian and Brazilian stocks and own almost no U.S. stocks. However, let's take a moment to review other factors that should impact an investment decision beyond just valuation. We'll also review why the U.S. market has performed better than many other markets over the past 116 years. 1. It is the fiduciary duty to act in the best interest of shareholders. If the economy is weak companies will lay off workers and return corporate cash to shareholders via buybacks and dividends to make up for weakness in Earnings Per Share growth. The opposite occurs in countries such as Germany and Japan where employees are considered "stakeholders" of the company and are treated with far more care (mass layoffs are rare). 2. Many of the best opportunities in non Anglo-Saxon countries are closed to public investors. In other words, some of the best companies in many countries tend to stay private and do not rely on public ownership (selling stocks) for financing and growth. Imagine if Coca-Cola, IBM, Microsoft, and others decided to stay private instead of going public. It would completely reshape the performance and perspective on U.S. stocks. 3. Dedication to stable government. Three through seven on this list should be self-explanatory but they are critically important for investment decisions. Investors in Germany were wiped out in the early 1920's when the country experienced hyperinflation. Argentina was one of the ten richest countries in the world entering the 1900's (ahead of France, Germany and Italy) and it was widely considered a better investment region than the United States. We only know now, with hindsight, that U.S. investors experienced an incredible run throughout the entire 1900's while investments in Argentina languished. During the 116 period in the charts above Brazil averaged 4.9% real growth while the United States averaged 3.5%. However, the U.S. grew its global market share from 15% to 52%. Just as with valuation, economic growth should not be considered the only factor when making investment decisions. 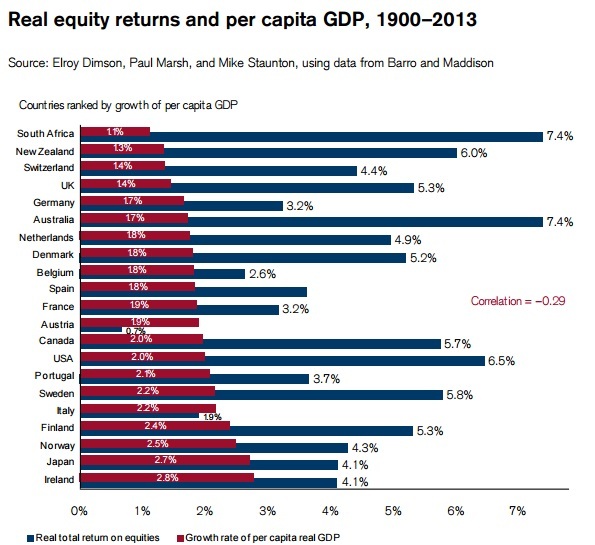 The graph below shows there is no consistent correlation between GDP growth and equity returns. It means investors have to do their homework before investing in a country and not make a purchase based on one single factor (stocks are cheap, economic growth will be strong, ect.) Those are important factors, but they are not the only factors. Investors must also consider the seven reasons reviewed above, as well as the macroeconomic and global financial forces that can impact both the currency and the financial markets. I will continue to focus heavily on the last two as we move forward this year.